The 2015 Recommendations for Preventing Fracture in Long Term Care, is the first guideline in Canada focused on preventing fractures among the frail and elderly in long-term care, where fractures are much more common than among community-dwelling seniors. Launched in 2015, the Recommendations include an integrated falls and osteoporosis assessment as well as various treatment strategies is specifically designed to reduce immobility, pain, hospital transfers and most importantly, improve the quality of life of residents at these facilities. 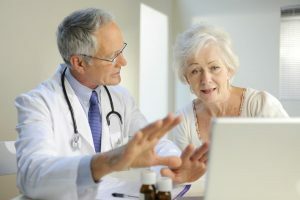 The 2015 Osteoporosis LTC Recommendations Presentation informs you how to apply the 2015 Fracture Prevention Recommendations for frail older adults in long-term care; improve fracture risk assessment and identification of residents at high risk and how to choose non-pharmacological and pharmacological therapies for residents at high risk of fracture. 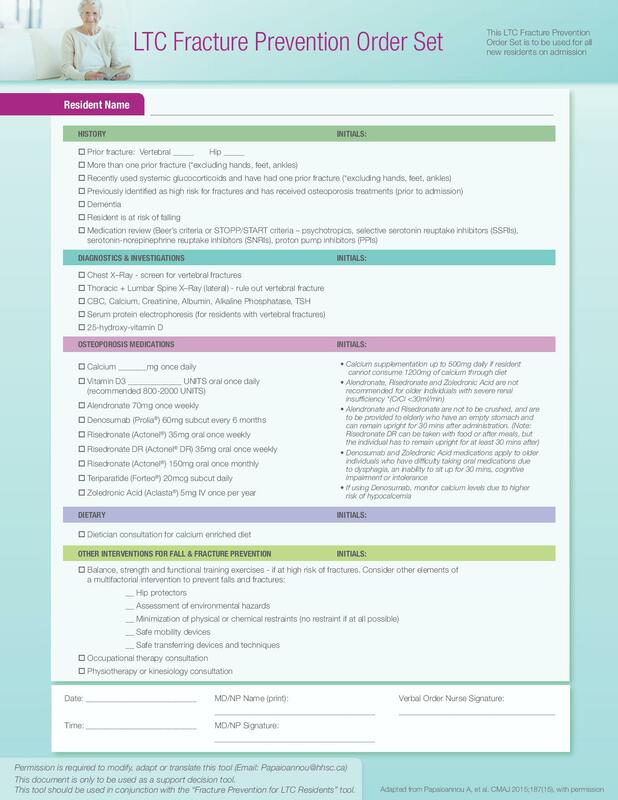 In the March 2018 webinar ‘Keeping it Together – Supporting Osteoporosis Knowledge in Long-Term Care Homes’, the OOSLTC and the OARC introduced their new newly developed ‘Keeping it Together’ Resident Conversation Sheet about osteoporosis, which is designed specifically for residents to facilitate understanding of the importance of fracture prevention practice within their long term care homes, thereby helping to promote good bone health and quality of life for all long term care residents. The Ontario Osteoporosis Strategy for Long Term Care (OOSLTC) in collaboration with the Ontario College of Family Physicians (OCFP) has developed a certified webinar program, ‘Clinical Application of the Long-Term Care Fracture Prevention Recommendations for Frail Older Adults.’ The program presents a comprehensive approach to deliver non-pharmacological and pharmacological therapies to reduce immobility, pain and transfers to hospitals while improving the quality of life of residents in LTC. 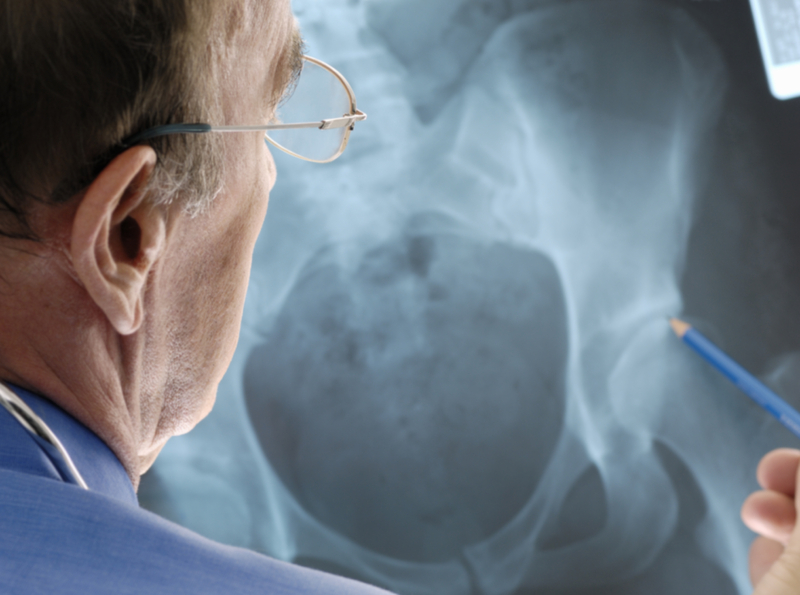 The Long Term Care Safe Administration Therapy Tool for osteoporosis was revised in May 2018 by the Ontario Osteoporosis Strategy and GERAS Centre for Aging Research to include recent changes to the Limited Use Codes. Older adults living in long term care are at high risk of fragility fractures. Learn more about fracture cause, fracture risk and human/financial costs associated with fragility fractures in long term care and what the Ontario Osteoporosis Strategy for Long Term Care (OOSLTC) is doing to prevent fractures among older adults residing in LTC. This 2-page quick reference guide is a tool that provides a quick summary of information including Fracture Risk Assessment on Admission and Fracture and Fall Prevention Strategies for residents living in long-term care environments. Ce guide de réferénce rapide de la page 2 est un outil qui fournit un récapitulatif rapide de l’information, y compris l’évaluation du risque de fracture sur l’admission et la fracture et stratégies de prévention des chutes pour les résidents vivant dans des environments de soins à long terme. This 1-page LTC Fracture Prevention Order Set is to be used for all new residents on admission. The Order Set includes History, Diagnostics and Investigations, Osteoporosis Medications, Dietary and other interventions for Fall & Fracture Prevention. 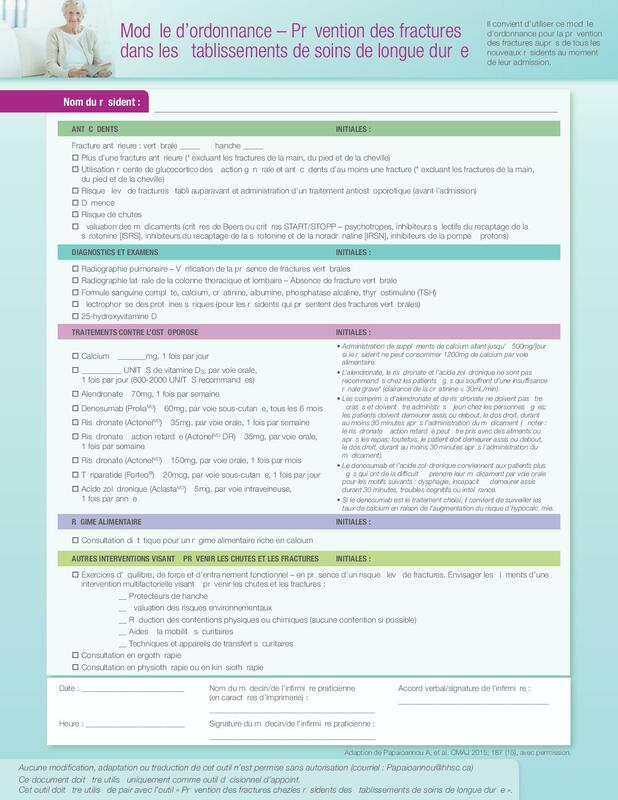 Cette 1 page afin de prévention de fracture Jeu de FLC est d’être utilisé pour tous les nouveaux résidents à l’admission. La commande set comprend l’historique, les diagnostics & AMP; enquêtes, médicaments pour l’ostéoporose, diétětiques, et d’autres interventions pour l’automne & la prévention des fractures. 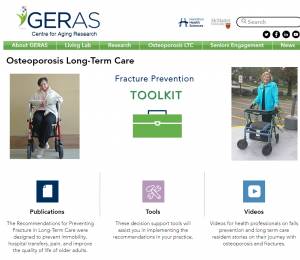 For more resources and videos on osteoporosis and fracture prevention in LTC, visit: Geriatric Education and Researching in Aging Sciences (GERAS) Centre website.